This topic describes the options for setting the process configuration. To configure Tableau Server processes, you need to specify which processes and how many instances should run on each node. You do this using the tsm topology set-process command. For more information, see Changing the number of processes on a node. Looking for Tableau Server on Linux? See Process Reference. Except where explicitly noted in the table below, applying changes in processes will stop Tableau Server if it is running when you apply those changes. After changes are applied, Tableau Server is returned to the state it was in before process configuration, so if the server was running, it will be restarted. Important: Your process topology will depend on your organizational needs. Every licensed process needs to regularly contact the Tableau Server License Manager service that runs on the initial Tableau Server computer to verify they are licensed. If they cannot confirm there is a valid license, for example, if the initial node is not available, the process will not run and Tableau Server may not function properly or reliably. The "Licensed" column in the table below identifies those processes that require a valid license, and which impact the count of cores in core-based licenses. Tableau Server Processes These processes have a status of running when Tableau Server is running, and stopped when Tableau Server is stopped. Backgrounder backgrounder The Backgrounder runs server tasks, including extract refreshes, subscriptions, ‘Run Now’ tasks, and tasks initiated from tabcmd. When Backgrounder is installed, Data Engine is also installed, unless the node already has an instance of Data Engine. In most situations you can change the number of backgrounder instances on an existing node of a running server without causing a stop and restart the server. An exception is if you are adding backgrounder to an existing node that did not previously have backgrounder or any other process that also installs Data Engine. For more information, see Tableau Server Dynamic Topology Changes. Elastic Server elasticserver Elastic Server is used by Ask Data to index and cache data. Only one Elastic Server process can be running and it can optionally be moved to any node in the cluster. The Elastic Server heap size can be configured by using the elasticserver.vmopts TSM configuration option. For more information, see tsm configuration set Options. Repository pgsql The PostgreSQL repository is the main database for Tableau Server. It stores workbook and user metadata. You are limited to a maximum of two instances of the repository in a cluster, and must have at least three nodes in the cluster to add a second repository instance. SAML Service Cannot be configured manually. The SAML Service acts as a proxy between Tableau Server and SAML Identity Providers (IdPs). Automatically installed on each node where you install Tableau Server. Shows a status of stopped in output of tsm status -v unless site SAML is enabled. You cannot configure the SAML Service manually. The Tableau Prep Conductor runs a flow, checks connection credentials, and sends alerts if a flow fails. 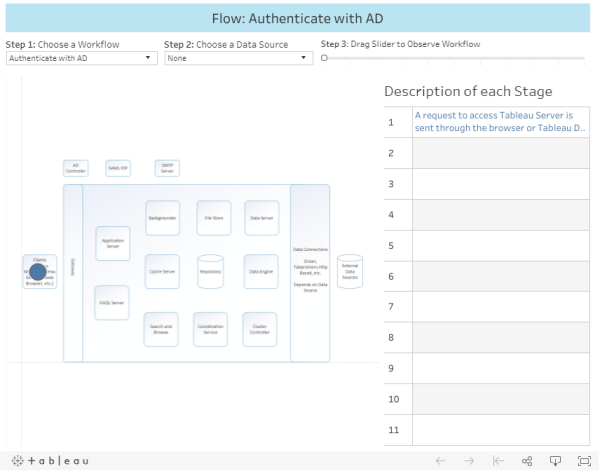 It leverages the scheduling and tracking functionality of Tableau Server so you can automate running flows to update the flow output. Requires Data Management Add-on to enable this on Tableau Server. By default, it is automatically enabled on a node where backgrounder is enabled. If the node role is set to exclude flows, then Tableau Prep Conductor is not installed on that node. For more information, see Node Roles in Tableau Server. VizQL Server vizqlserver The VizQL Server loads and renders views, computes and executes queries. When VizQL Server is installed, Data Engine is also installed, unless the node already has an instance of Data Engine. In most situations you can change the number of VizQL instances on an existing node of a running server without causing a stop and restart the server. An exception is if you are adding VizQL to an existing node that did not previously have VizQL or any other process that also installs Data Engine. For more information, see Tableau Server Dynamic Topology Changes. Tableau Microservice Container Processes These processes are automatically added when one of the microservices they contain is added to a node. Container status depends on the status of the microservices within the container. If all microservices are running, the container process has a status of running. If all microservices are stopped, the container process status is error. If one or more microservices is running while others are not, the container service has a status of degraded. For more information, see Tableau Server Microservice Containers. Tableau Services Manager (TSM) Processes These processes have a status of running once TSM has been initialized, and remain running even when Tableau Server is stopped. Administration Agent Cannot be configured manually. The TSM Agent monitors the Coordination Service for changes to configuration or topology and delivers new configurations to each service (configuration) or deploys new services and removes old ones (topology) Automatically installed on each node where you install Tableau Server. You cannot configure the Administration Agent manually. Administration Controller Cannot be configured manually, except to move it to another node. For more information, see Recover from an Initial Node Failure. The TSM Controller handles requests to TSM and orchestrates configuration and topology changes and workflow across service processes. The Controller also serves as the REST API endpoint (HTTPS). Automatically installed when you install TSM on the initial node. You cannot configure the Administration Controller manually except to move it to another node. For more information, see Recover from an Initial Node Failure. Client File Service clientfileservice The Client File Service (CFS) manages most shared files in a multinode cluster. For example, authentication related certificates, keys, and files (OpenID, mutual SSL, SAML, and Kerberos), and customization files are managed by CFS. Automatically installed on the initial node. No other instances are installed unless you explicitly configure them. See Configure Client File Service . In multi-node deployments, we recommend you configure an instance of CFS on each of the nodes where you deploy the Coordination Service. Redeploying the Coordination Service does not have any impact on CFS. CFS does not display in the Status page or the Configuration page but is visible in the output of the tsm status -v command. To view or set instances of CFS, use the tsm topology command. Service Manager Cannot be configured manually. The Service Manager Automatically installed on all nodes. You cannot configure the Service Manager manually. License Manager Cannot be configured manually. The License Manager handles licensing. Automatically installed on the initial node when you install TSM. Tableau Server Maintenance Processes These processes have a status of stopped unless they are actively running to complete a job. Database Maintenance Cannot be configured manually. The Database Maintenance service is responsible for performing maintenance operations on the Tableau Server repository. Automatically installed on each node where you install Tableau Server. Shows a status of stopped in output of tsm status -v unless it is actively performing database maintenance. Maintenance can include updates related to enabling remote access to the repository and changing passwords used to access the repository. You cannot configure the Database Maintenance service manually. Backup/Restore Cannot be configured manually. The Backup and Restore service is responsible for performing backup and restore operations on the data stored in the Tableau Server repository and file store. Automatically installed on each node where you install Tableau Server. Shows a status of stopped in output of tsm status -v unless it is performing a backup or restore operation. You cannot configure the Backup and Restore service manually. Site Import/Export Cannot be configured manually. The Site Import and Export service is responsible for migrating Tableau Server sites between server clusters. Automatically installed on each node where you install Tableau Server. Shows a status of stopped in output of tsm status -v unless it is performing an import or export. You cannot configure the Site Import and Export service manually. The Tableau Server processes and how they interact depend on what action or activity is taking place. For example, the processes that are used, and how they interact, differ when you publish a workbook from those used when you sign in using SAML. For some interactive views on process workflow, see the below workbook. This allows you to select a particular workflow and follow it step by step from start to finish. Disclaimer: This workbook is published on Tableau Public and is not maintained by Tableau documentation. We cannot guarantee that it is up-to-date with the latest version of Tableau Server.